To be completely honest I was a little apprehensive about heading out on my 21,000km Toronto-Alaska-Montana-Toronto trip, kitted out with brand new gear from Aerostich. Of course I knew that Aerostich gear had a good reputation for quality and comfort but I was going to have to live in it every day for five weeks in all kinds of conditions without the ability to wash or maintain it. It would have to deal with terrain varying from 90 mile an hour interstates to first gear single track trails. 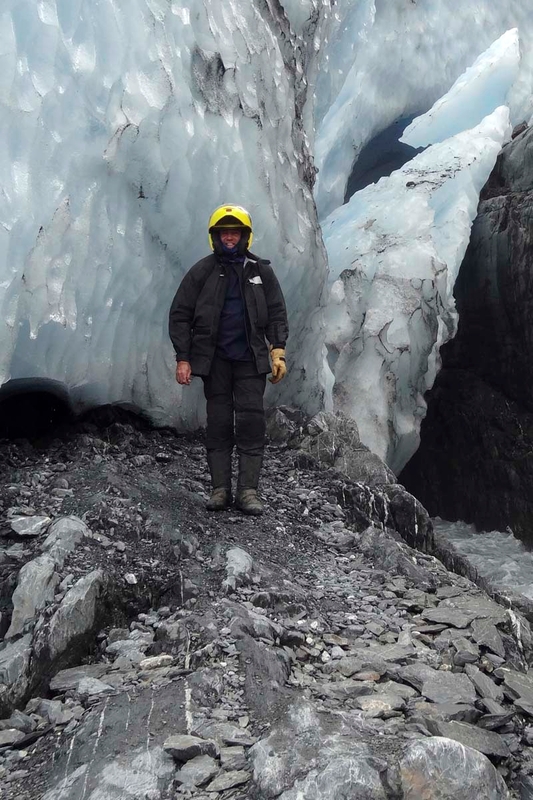 I would experience temperature extremes from 0° C to 35°C and everything from choking dust to torrential rain. Since I didn’t have the space to carry back-up options – if it didn’t work out it would be a disaster. To kick off the updates of the Aerostich gear I got for testing, I’m going to start with the riding suit – a DarienLight jacket (with fleece liner and back protector), and DarienLight pants (with fleece liner). The jacket retails for $497, the pants are $327; liners cost $217 for the top, $103.50 for the bottom, and the back protector is $67.50 – all prices are in US dollars on the Aerostich site. Aerostich claim that the Light version of the popular Darien Jacket is warmer in the cold and cooler in the heat than the regular version, which is why I selected it due to the off-roading and varying conditions I expected to encounter. Being less bulky it would also allow greater freedom of movement and perhaps be more comfortable over the long haul. The Darien Light’s waterproof Gore-Tex layer is bonded to the outer shell. It’s not a separate layer, like many other textile jackets. Blessed with Gore-Tex bonded to the outer shell (not as a separate liner) it should be completely waterproof and still breathe well. The T3 back protector would provide an additional layer of protection and the separate, TLTec fleece liner would provide warmth when necessary. In typical CMG style, the jacket arrived only a couple of days before departure so I was a little nervous when trying it on, though it turned out that the fit was pretty good. With the back protector and fleece liner installed and wearing a thick long sleeved shirt it was a little snug but as it broke in (stretched) it became a perfect fit. On the way out it rained non-stop from Sudbury to well past Sault Ste Marie (over 350 kilometers) and the temperature dropped to about 10°C. The jacket did not leak a drop of water anywhere not even around the neck although I had a buff helping it to seal. With the fleece liner, Warren found the jacket warm to 5C. No wind leakage was noted and with the fleece liner in I was comfortable to about 5°C. Below 5°C I’d need another layer or an electric vest to remain warm. With the liner out and the vents all open I was comfortable to about 30°C as long as I kept moving. Up to 30°C there was sufficient airflow with the vents and cuffs open that I could keep the main zipper pulled all the way up. Above 30°C I’d lower the main zipper to supplement airflow. The Gore-Tex membrane’s ability to breathe was particularly noticeable in the desert where after sweating through a low speed technical section I’d dry off quite quickly once I picked up speed. The jacket was extremely comfortable right from the beginning thanks to the thinner material used for construction and the pre-curved arms. In spite of the lighter gauge material surprisingly little flapping occurred at speed when everything was cinched down. The armored pads at the elbows and shoulders stayed in place and were hardly noticeable while riding. There wasn’t any binding or chaffing anywhere – sitting or standing, with one notable exception; when it was really hot out and I was wearing a short-sleeved T-shirt under the jacket (something Aerostich recommend against by the way) the zippers for the underarm vents were really uncomfortable against the skin. Despite some low-speed tipovers, the Darien Light didn’t suffer any real damage. The Darien Light is constructed of 200 Denier HT Nylon material whereas the regular Darien utilizes heavier 500 Denier Cordura so the Light has its limitations when it comes to abrasion protection. 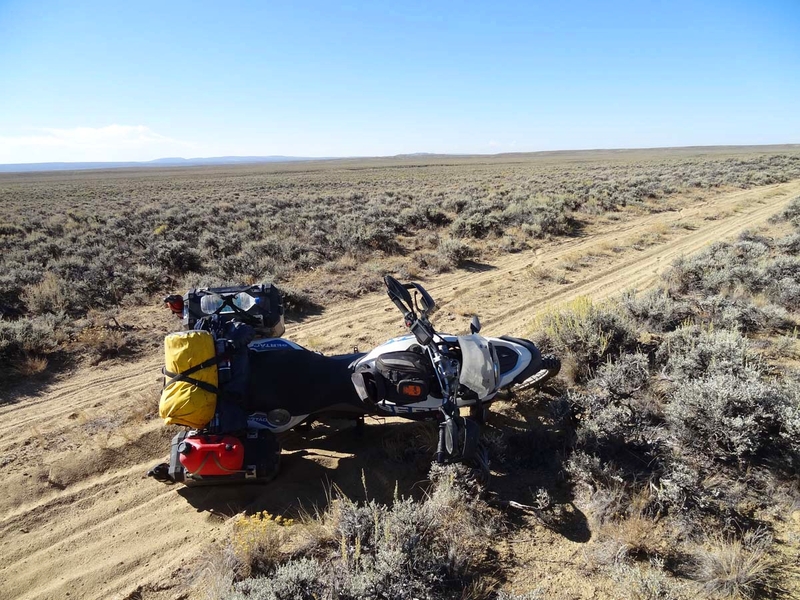 Although I fell five or six times during the course of the trip the tip overs all occurred at low speed in soft conditions so it wasn’t really a test of the jacket’s abrasion resistance. Nevertheless the jacket stood up well with no visible damage, the pads all stayed in place and I received no bruising. As far as conspicuity goes one of my buddies owns a Darien Jacket with the same reflective panel on the back and I can attest to just how bright it is. Riding behind him at night, it’s impossible to miss him even when using low beam. The jacket was easy to put on and take off with the zipper and assorted closures simple to operate. The underarm vents could be a bit tricky at times but I usually had to have someone open the big exhaust vent on the back anyway so I’d get them to help with the underarm vents at the same time. The forearm and large chest pockets were easy to use and were utilized every day. Here’s the ‘Stich’s underarm venting. The lower pockets at the front less so. Although waterproof, the lower pockets were difficult to access due to the sealing flap being stitched down at both ends. Add to this the relatively narrow opening and the fact that the jacket seemed to buckle across the pockets when you sat down, and the pockets became all but unusable on the bike. I rode in the Jacket every day for five weeks and fell in it at least five times. It was routinely drenched in sweat or mud and subjected to day after day of choking dust (I was usually riding sweep). It has over 30,000 km on it now and after throwing it in the washing machine it looks as good as new with no noticeable fading and it’s still completely waterproof. The only problems encountered with the jacket were the zips getting balky when coated with dust (the old trick of rubbing them with a dry bar of soap kept them going till they could be washed) and one of the Velcro pads that hold the armor in place getting separated from the jacket shell. There are a number of these pads throughout the jacket and the rest of them all seem fine. Like the jacket, the fleece liner has zippers for ventilation, along with some handy pockets. 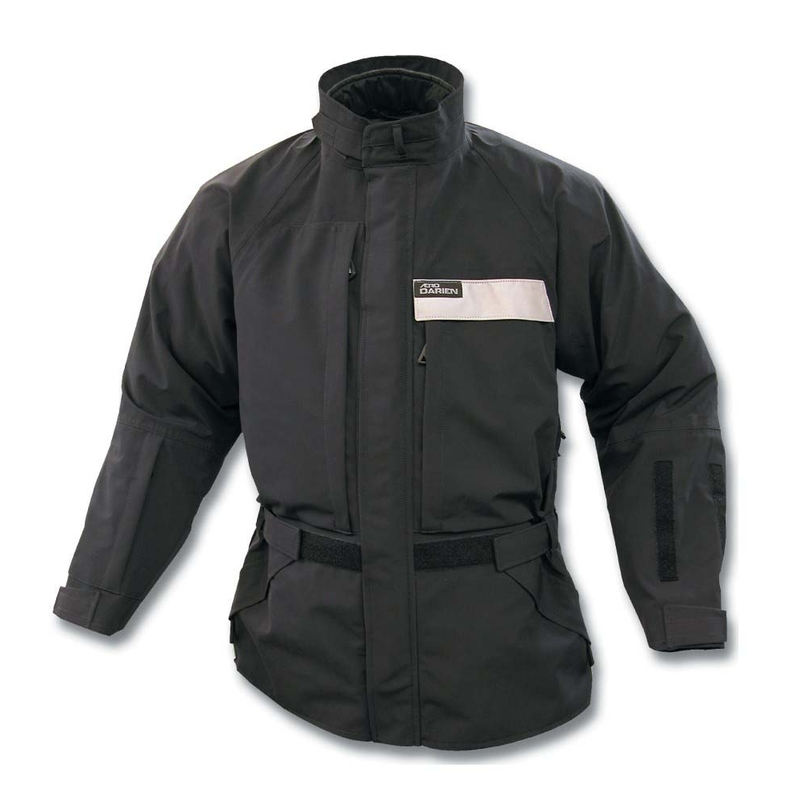 As the trip wore on I became more and more impressed with the jacket, it was extremely comfortable, waterproof and durable and with the optional fleece liner installed it offered excellent temperature control. It would have been nice if the lower front pockets were more accessible and it’s not the most stylish choice out there but these are niggles I can live with. The only real reservation I have is with the high-speed abrasion resistance that (thankfully) was not tested. Those worried about this may want to consider the heavier regular Darien jacket. 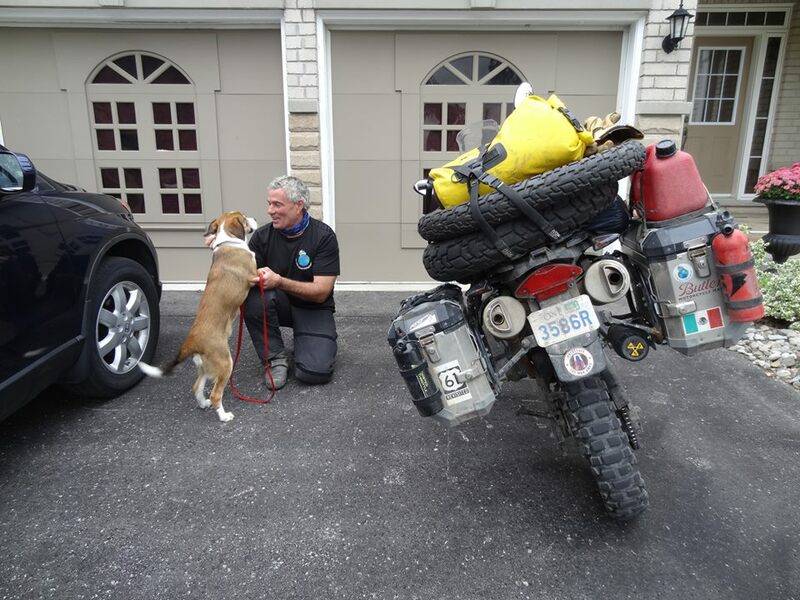 Warren wisely went with the black pants … it hides the dirt when you’re off-roading, don’cha know? Like the jacket the Darien Light pants were chosen with off-road riding and varied conditions in mind and like the jacket performed admirably. 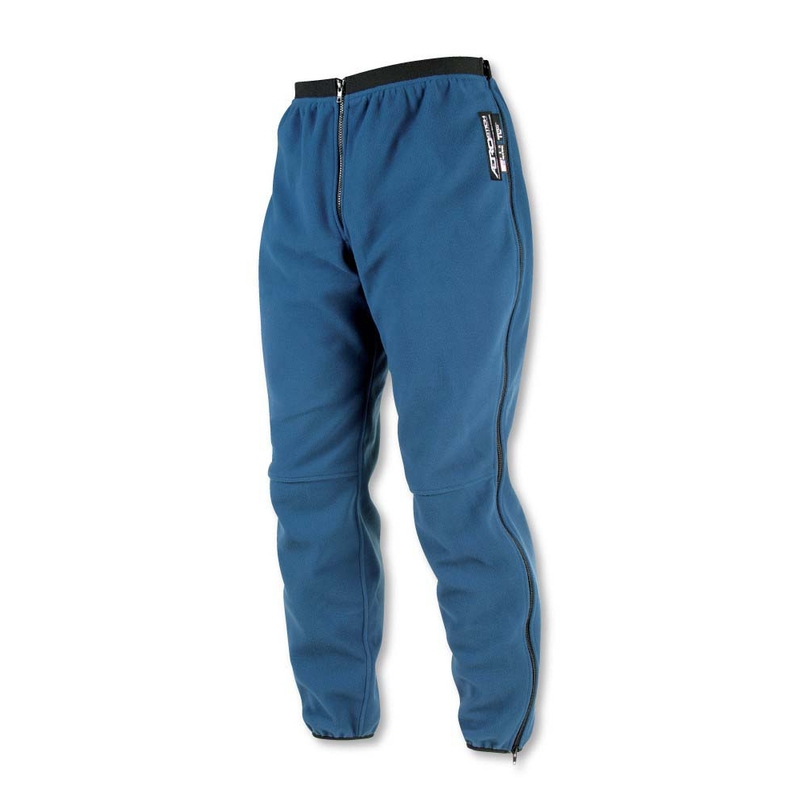 Although the Darien Light pants are intended to be worn as overpants I elected to wear them as riding pants wearing only a synthetic wicking layer underneath. Manufactured from the same Gore-Tex bonded 200 Denier NT Nylon material as the jacket, the pants are waterproof and windproof and offer a first line of defense against the elements. When trying on the pants for the first time I found them to be about an inch and a half too short but I had expected this. Aerostich do not offer, off the shelf pants, in the length I needed for the waist size I wanted. Since I was wearing them, as riding pants, not overpants, I ordered the waist measurement one size smaller (32”) than my usual (34”). I have a 34” inseam and the 32” waist pants (even in the “L” version) have a maximum 32” inseam. I could have ordered pants with a custom length as this is one of the great services Aerostich offer but alas there wasn’t enough time. 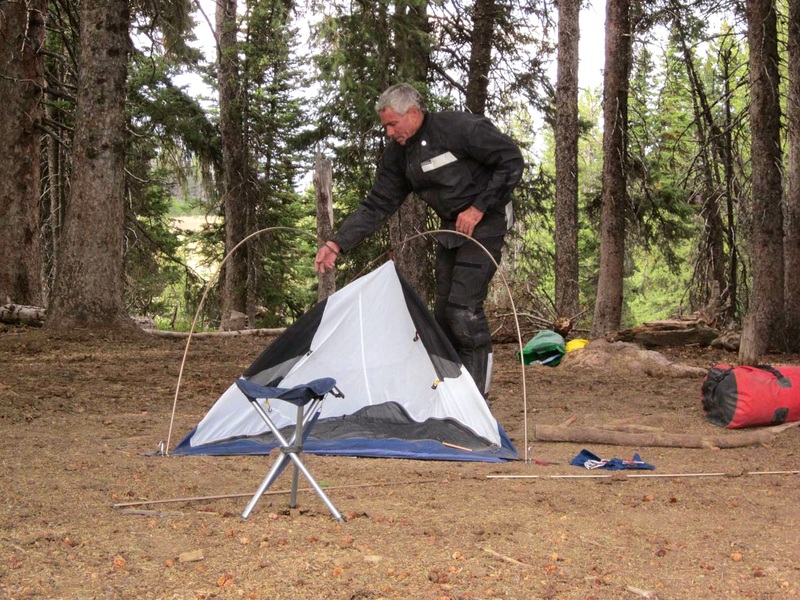 The Aerostich gear lived up to its Light name – Warren wore it around the campsite. I had mixed feelings anyway because the shorter legs would work well if worn inside boots and there would be less chance of snagging a footpeg when worn outside. With reduced boot overlap however I was a little concerned about leaks while riding in the rain but it turns out my fears were unfounded. The pants were 100% waterproof for the duration of the ride with no leakage in the usual suspect areas of crotch and leg zippers. The adjustable Velcro closure at the ankle sealed really well against my boots preventing road spray from forcing its way up between pants and boot. Built in Velcro panels on the inside of the shin area allow you to attach optional convenient rain covers for your boots that you fold out when it rains then tuck away again when no longer needed. Although I had little opportunity to use them on my big trip (I ended up wearing waterproof boots) I have subsequently used them and they work as advertised. Warren left his fleece liner for the pants at home. When he rode through Alaska, the jacket liner kept his upper body warm, but he had to buy long johns to keep his legs warm by the time he hit Alaska. The pants worked well in warm weather even though they are not vented. Gore-Tex allowed the shell to breathe nicely, working well with my wicking base layer to keep me cool and dry. In the cold it was a different story as I had foolishly left the fleece liner at home. Although completely wind proof, the Light Nylon material would transfer cold directly to my thin base layer when the temperature dropped. It clearly demonstrated the effectiveness of the TLTec fleece liner however because while my jacket was toasty warm with its fleece layer my legs were freezing. Eventually I stopped and picked up a pair of long underwear to get me through the Alaska portion of my trip. Once I returned to Toronto and had a chance to wear the pants with the fleece liner they were just as warm as the jacket. Made of thinner material, the pants feel every bit as comfortable as blue jeans while being less restrictive when moving about the bike. The kneepads stay in place at all times and don’t get in the way of gripping the tank. (The kneepads are also great for kneeling down to work on the bike). Warren found his DarienLight pants were as comfortable as a pair of jeans, by the end of his trip. Next time, he’s leaving the jeans home and packing his fleece liner. The waistband is adjustable in a number of different ways – in addition to a stretch panel in the rear and the usual button and zipper in the front, there are two position snaps on each side, and an adjustable belt with plastic buckle. I admit to having left at least a couple of these loose after a particularly large lunch. Aerostich offers optional suspenders which I did not opt for but I had no problems with the pants sliding down after kneeling bending or walking in them. 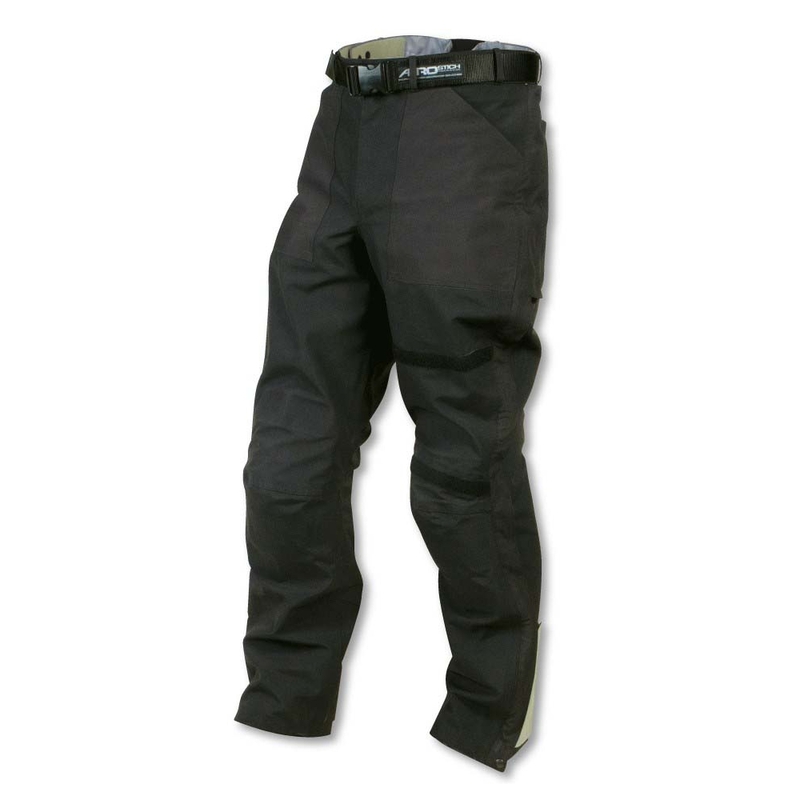 Like the jacket the Darien Light pants will offer inferior abrasion resistance when compared to the regular Darien. The pants come standard with kneepads but hip pads are an optional extra that you may want to consider. Reflective panels on the lower leg are very effective. 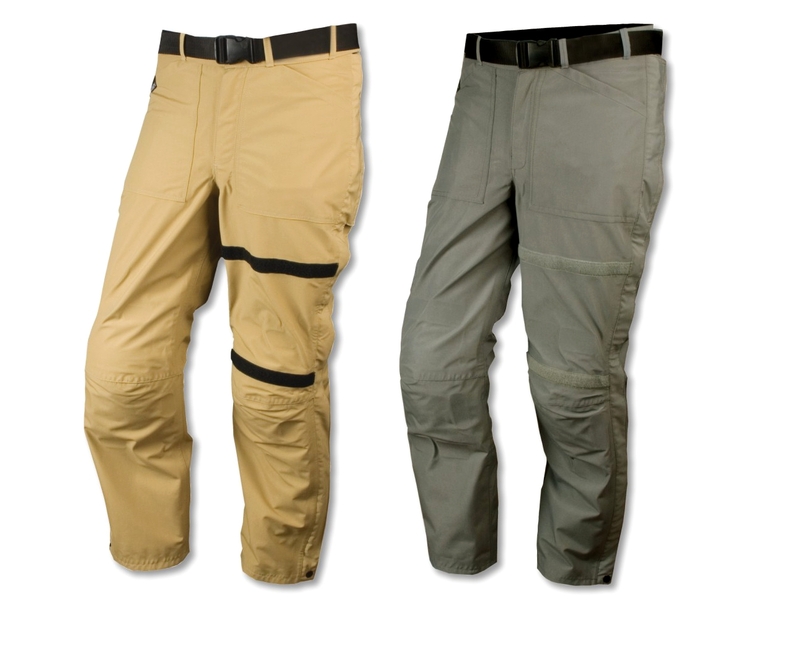 The DarienLight pants are also available in khaki and grey, but not in hi-viz. The reflective panels still offer great visibility at night, though. The full-length leg zippers made the pants very easy to put on and take off and although not recommended, offered some options for ventilation in hot weather. Since I was wearing the Darien Lights as pants and not overpants I rarely used the leg zippers but had no problems with them. A waterproof gaiter behind the fly helps prevent water entry but is cut low enough to facilitate access when nature calls. The three pockets were a little awkward to use with gloves on due to their aggressive Velcro closures but were large enough. One of the best features was the Velcro closure at the ankle that had a wide range of adjustment. You could secure the pants tightly against your legs to go inside your boots, tight against your boots to seal out dust, mud and water or leave them loose to improve air circulation. Snaps at either end of the full-length leg zippers and at the waist were a little stiff to operate and became more so with dust accumulation but never popped open on their own. Like the jacket, the pants were subjected to difficult conditions with little sign of wear and tear. Despite being in dust, mud or road spray for most of the journey a quick run through the washing machine returned them to pristine appearance. The knees are particularly note worthy because after numerous falls and tire changes they still show no signs of wear. Zippers and snaps are all functioning well and the Velcro closures seem to have lost none of their grip. By the end of the trip I had worn the pants continuously for five weeks and even slept in them on one particularly cold night. The greatest testament to the comfort of these pants, is the fact that I never once bothered to change into my jeans at the end of the day, my Levis just sat in the bottom of my saddlebag for the entire trip. I wore the Darien Lights during set-up and teardown of the campsite and all the time I was working on the bike (including twelve tire changes). Next time I’ll leave the jeans at home and take the fleece liner. Gear with Gore-Tex waterproofing, like this Aerostich Darien Light, carries a guarantee of satisfaction. Puttering around the campsite, in a pair of DarienLight pants. 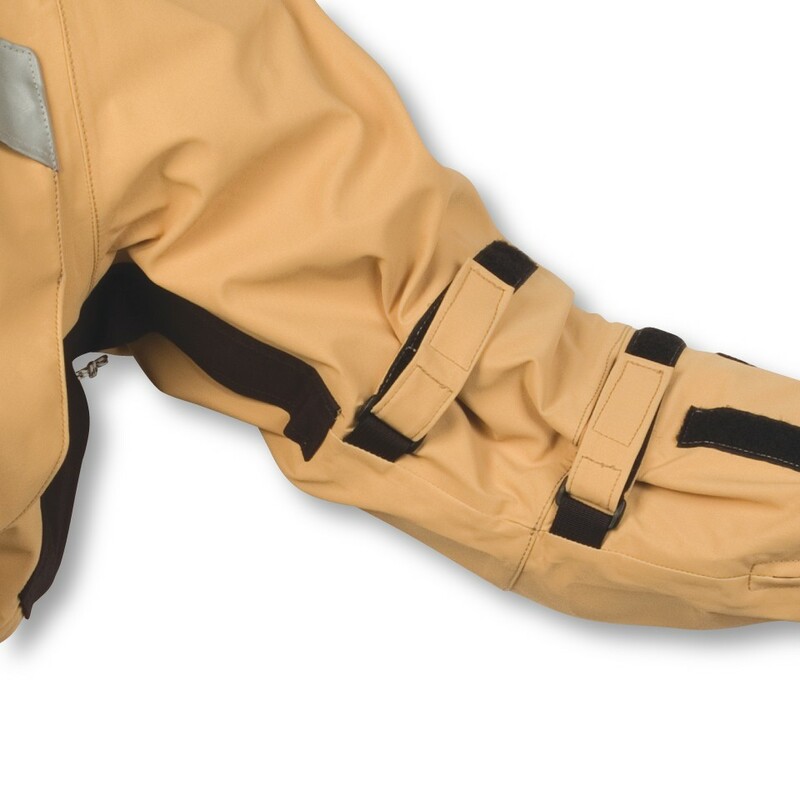 The fleece liner costs extra, but provides an effective base layer. Like the jacket, the fleece liner has zippers for ventilation. Ive been using my Roadcrafter suit for years and wouldnt go anywhere without it. I have found that the small silcon lube that comes with Arai helmets is great for lubing sticky zippers. Fortunatley I live only a couple hours from the Aerostich factory outlet.